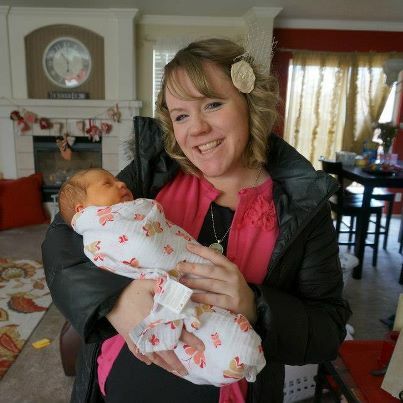 My dear friend Chelsey just had this darling little baby girl, Grace. I love that I got to hold her just days after her birth and sense the grandness of life. It's remarkable. When I think about it for long enough, I just have to cry, the fact that life can beget life. I will miss being pregnant, but it's definitely getting uncomfortable. The stitches came out yesterday! I was hoping I would be one of those woman that spontaneously goes into labor, but alas, almost 24 hours later, and nothing. Here is a picture of a picture of the 3-D ultra sound the perinatologist tried to take for us, but as you can see, at this point, there is no room in the inn for a camera to snap a picture. He tried hard to get her to move her hand and arm away from the side of her face, but she wasn't having it. 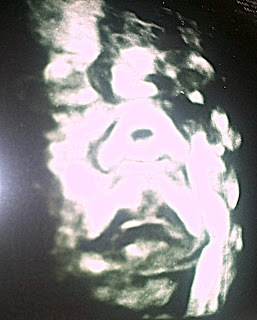 She looks pretty squashed--especially her nose :). 1) When are you gonna have that baby already? 2) You look like you're going to pop! 3) You looked like you were due 2 months ago! Yes, these are the common greetings I receive. If I knew when I was having this baby, my life would be a lot less exciting. I don't know of any pregnant woman whose belly has ever really popped open like a balloon. AND, I'm grateful I didn't have her two months ago, though she would have shared my cousin Crystal's birthday, and that would have been tender. Amazing grace. How sweet the sound. I've no less ways to sing His praise than when I first began. This is truly an incredible experience that I give thanks to God for multiple times daily. I do not doubt that HE has preserved this child. Let her take her time in coming--she is long awaited.